Are you moving to or from the Netherlands? Then removal company Henneken is your best choice! 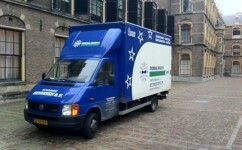 Removal company Henneken has been carrying out removals since 1870! Each year our removal company carries out approximately 450 high quality moves between Holland / Belgium and the UK / Ireland and vice versa. With our modern vehicles and experienced staff, removing company Henneken is known as a reliable removing company for overseas removals between the Netherlands and the UK. Cities in the Netherlands we are often moving English people to, are Amsterdam, Rotterdam, The Hague, Utrecht and Eindhoven. Did you know that moving is in 3rd position of the top 10 stress factors in life? Since a good preparation of your removal to the Netherlands is half the battle, our removal company is pleased to help you with a useful checklist in order to prevent stress. Please do not hesitate to contact us if you are interested in our checklist. Are you going to move temporarily to the Netherlands, for example for work? Then you may have only a few items that should be moved. Please feel free to ask our removal company for a removal quote, even if you have only one or two items to move. Since you can choose for a combination trip or groupage shipment, it is possible to benefit from interesting rates! Please do not hesitate to request a free removal quote by completing our removal quote form. You will receive our offer within two days. If you want more information, you can also call us: +31 (0)79 – 361 13 68. Moreover, it is also possible to make an appointment for a free pre-move survey visit by one of our surveyors right away.